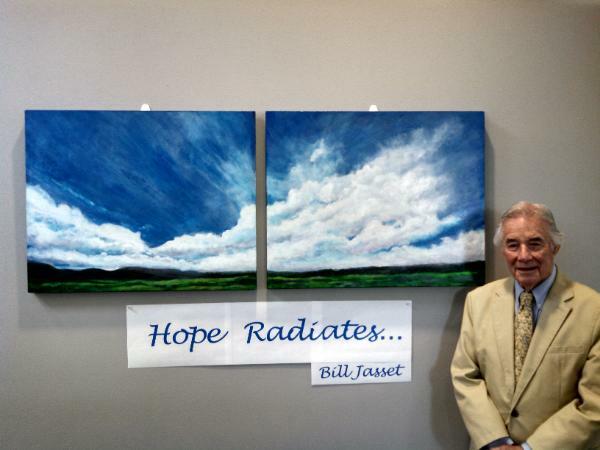 Bill Jasset is not a typical 90-year-old. He exercises every other day, is active in local organizations and is an accomplished painter. He sells his landscape and cloud paintings at the New Mexico State Fair each year. Jasset also keeps up with current events and speaks articulately on a wide range of topics. Jasset does all of this passionately and with very limited vision. As Jasset aged, he developed macular degeneration, an eye disease caused by the deterioration of the central portion of the retina. The disease causes blindness and mostly impacts seeing straight ahead. However, Jasset’s peripheral vision is still good, so he is able to keep up with his hobbies. Jasset grew up in Massachusetts. He served in the Air Force during World War II before completing his degree at Boston University. He went on to have a successful 30-year banking career, working in business development and marketing. He stayed interested in flying by getting involved with the MIT Soaring Association while in Boston. In 2000, he moved to Albuquerque. Today, he paints large (3-by-4-foot and 4-by-4-foot) sky paintings because it reminds him of his flying days. He is currently involved with the Albuquerque Soaring Association. “I paint clouds because they are big and abstract. I just copy what I’m looking at from my back patio,” Jasset explains. He is able to paint in large scale even with his vision limitations with the help of his peripheral vision. On top of everything else, Jasset is a lover of books and news magazines. But how does he read with such limited vision? Jasset is a patron of the New Mexico Library for the Blind and Physically Handicapped, a program of the New Mexico State Library in Santa Fe. The LBPH, also known as the “talking book library,” delivers special audio playbook equipment and recorded books, magazines and newspapers to qualified patrons (blind, visually impaired, physically handicapped and reading disabled) free of charge. The New Mexico LBPH is an affiliate of the National Library Service for the Blind (NLS), established by the Library of Congress. The NLS distributes talking book titles nationwide, and the New Mexico LBPH produces some recordings locally as well. The NLS recently launched mobile apps for iOS and Android, allowing patrons to digitally download titles and making it even easier for them to access books, magazines and newspapers. Jasset is able to do some reading on his own. He uses a high-powered magnifying glass provided by the Veterans’ Administration to read the newspaper each morning. But with all of his interests, he doesn’t have a lot of time to just sit and read. With talking books, he can multi-task. Jasset listens to his books for hours on end, every day, especially while painting. “Reading is my main entertainment,” he says. He also takes long walks and brings along his playback equipment in a tote bag to listen to as he strolls. From espionage and detective tales to nonfiction works on comparative religions, government, international relations, and literature, Jasset is like a sponge soaking up words from his talking books. “I get invited to a lot of cocktail parties, because I can talk about anything,” Jasset says with a laugh. The staff at the LBPH not only sends books to patrons upon request, but they do readers’ advisory as well – sending books that a patron might be interested in based on checkout history and interests. Jasset has been a patron for over five years. “The services the library provides are one word: colossal,” Jasset says. “The staff is made up of magnificent human beings. They are a delight to talk to. They send me books that I don’t even ask for, but they know I’ll like. They are that kind of people. Weekly, he listens to The Economist magazine. “It’s a huge help to me, keeping up with the world.” It takes him seven hours to listen to it, and it is recorded by professionally trained speakers in London. Once, the library sent Samuel P. Huntington’s “Clash of Civilizations,” to Jasset and it had a profound impact on him. “It can’t help but get you interested in comparative religions,” he says. Jasset is a member of the Albuquerque International Association. He recommended the book to the group, and gave a plug for the LBPH as well. “Most people in the groups I belong to are retired. They may need the LBPH someday, too,” he says. Word of mouth is a key way the LBPH grows its patronage. “I tell people about the service all the time,” Jasset says. As a retiree, he knows how hard it can be to pass the time some days. Interested applicants should visit our LBPH website to review eligibility requirements, an application form, and how to order and download books.